Comfortable to use and less likely to mist. Lift up visor. Face Guard is rated 4.5 out of 5 by 27. Rated 5 out of 5 by TriTim from Better than goggles I struggle with goggles steaming up, especially when wearing a dust mask, so I thought that this would be a better idea that would encourage me to wear eye protection! Worked a treat; nice, clear visor and comfortable to wear. I was able to wear a dust mask and ear defenders with no problems, and flip the visor up out of the way when not in use. Rated 5 out of 5 by Competent DIYer from Film on BOTH sides! Good face guard and screen. Guard is comfortable and adjustable and lite to wear. It has some padding, which is nice. Screen needs film removing on BOTH sides. It does scratch easily but I think it's made from polycarbonate, which scratches very, very easily. The guard can accommodate a larger screen so I'm unsure why it's not the full size. Also it's a pity that TS do not sell spare screens. If you are doing any sort of work with hot metals or chemicals then wear glasses and a screen and this one can also be worn with a simple face mask. 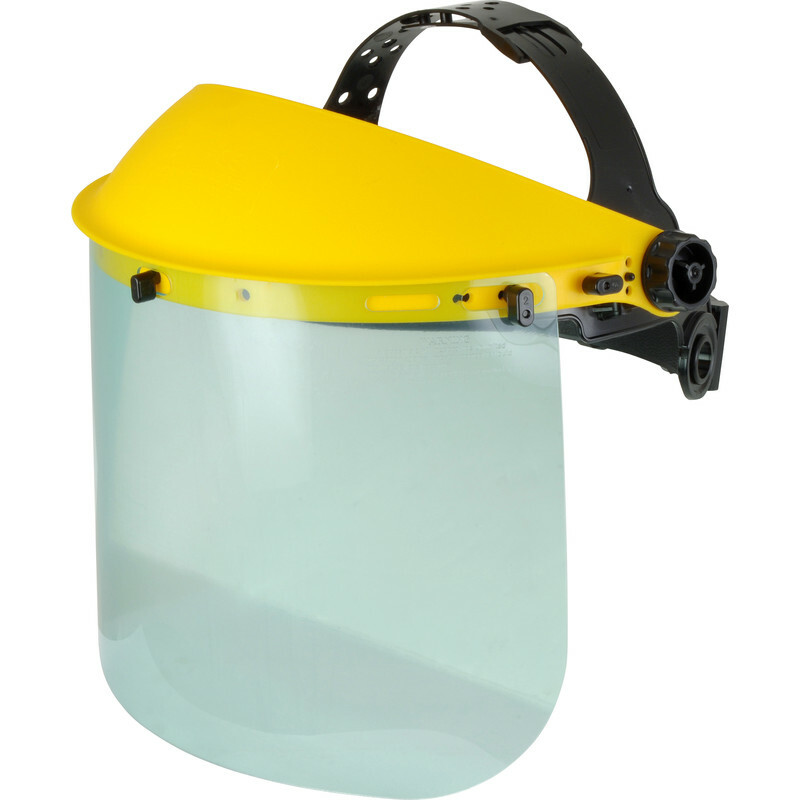 This is the cheapest face guard I've seen, but (other than the mentioned shortcomings) is a very adequate product. Given where the bands sit on the head I find it doesn't go too well with my over the ear (Peltor) ear defenders. Rated 4 out of 5 by Leigh SD from Great Value Good value and does the job. NB. There is protective film on BOTH sides, take them off and its crystal clear. Rated 5 out of 5 by Aerialman 1 from It works Bought for use with an angle grinder and does a good job doing what is supposed to do. Reasonable price.